A Saab 340A passenger plane, registered LV-CEJ, was destroyed when it crashed 20 km north of Prahuaniyeu, Argentina. The 19 passengers and three crew members on board did not survive the accident. The airplane operated on SOL Líneas Aéreas flight 5428 from Córdoba (COR) to Mendoza (MDZ), Neuquén (NQN) and Comodoro Rivadavia (CRD). The flight departed Neuquén at 20:05 for the final leg of the flight. The aircraft climbed to FL190. After flying for 24 minutes, the pilot levelled the aircraft at 17800 ft, and remained at this level for approximately 9 minutes. When flying at FL179, the aircraft began to pick up ice. The copilot radioed air traffic control for permission to descent. The flight was then cleared down to FL140. However, while descending the crew members commented on the growing ice accretion on the wind shield and wings. By the time the aircraft had reached FL140, the icing conditions were severe. The aircraft flew for approximately two minutes with a straight and level flight attitude, increasing the accumulation of ice. The airspeed dropped until the airplane stalled. The pilots attempted to regain control of the plane, but failed. The airplane impacted terrain and burned. > Entering an area with icing conditions without adequately monitoring the warning signals from the external environment (temperature, cloudiness, precipitation and ice accumulation) or the internal (speed, angle of attack), which allowed for prolonged operations in icing conditions to take place. > Receiving a forecast for slight icing - given that the aircraft encountered sever icing conditions - which led to a lack of understanding regarding the specific meteorological danger. > Inadequately evaluating the risks, which led to mitigating measures such as adequate briefing (distribution of tasks in the cockpit, review of the de-icing systems, limitations, use of power, use of autopilot, diversion strategy etc.) not being adopted. > Levels of stress increasing, due to operations not having the expected effects, which led the crew to lose focus on other issues. > Icing conditions that surpassed the aircraft's ice protection systems, which were certified for the aircraft (FAR 25 Appendix C). > Inadequate use of speed, by maintaining the speed close to stall speed during flight in icing conditions. > Inadequate use of the autopilot, by not selecting the IAS mode when flying in icing conditions. > Partially carrying out the procedures established in the Flight Manual and the Operations Manual, when entering into areas with severe icing conditions. > Realizing late that the aircraft had started to stall, because the buffeting that foretells a stall was confused with the vibrations that signify ice contamination on the propellers. > Activation of the Stick Shaker and Stall Warning at a lower speed than expected in icing conditions. > Using a stall recovery technique which prioritized the reduction of the angle of attack at the expense of altitude loss, and which was inappropriate for the flight conditions. > The aileron flight controls reacting in an unusual manner when the aircraft lost control, probably due to the accumulation of ice in the surfaces of these, which made it impossible for the aircraft to recover. 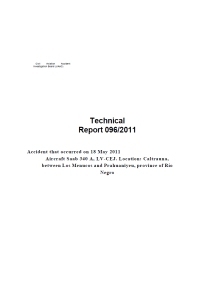 In order to spread and promote the analysis of these findings, presented in this report by Aviation Authorities from around the world, and in accordance with the interest of the FAA (USA) and SHK (Sweden), it is recommended that the AIG Division transfer the following to the appropriate authorities in order to promote a new concept of instructing and training of flight crews. to make UPSET RECOVERY a mandatory part of the flight simulator training curricula, which is to be practised both during the initial and the recurring courses and evaluated during the suitability inspection. With the aim of increasing the quality of the flight crew training, the authorities are recommended to establish a workshop programme for instructors who teach initial and recurrent training for commercial airline operators, during which technical and didactic subjects are taught, that directly focus and relate to operational security. Consider the possibility of extending the service hours of the aerodrome\'s meteorological offices, to cover all the hours that these aerodromes operate, and to provide updated information that effectively contributes to Operational Safety. Consider modifying the aeronautical information system so that an aviation area forecast (arfor) which remains the same is not merely updated as NOSIG, but repeats the information of the previous arfor. To establish an efficient network of aeronautical communications, it is recommended that a system be implemented which ensures that aeronautical communication traffic works both ways, in areas where this is deficient. In additions, the benefit of establishing, implementing and maintaining an effective VHF communication network, with permanent national coverage, should be evaluated. To establish clear guidelines regarding the requirements of on-board communication equipment, a proper study on aircraft traffic communication should be conducted, in order to determine the need for aircraft to be equipped with HF frequency communication devices. To review the possibility of recommending that the aircraft manufacturer has Special Safety Bulletins, with the findings of this investigation and those of three similar incidents that have previously occurred. To evaluate the possibility of recommending that designers of flight simulator software and hardware, include simulations of various situations in icing conditions (general, disrupting aerodynamic functions, blocking control surfaces, affecting the flight attitude due to a shift in CG, etc. ), in order to provide better training with regard to recognising these flight situations, as well as the techniques that need to be employed in these situations. With the aim of increasing the aircraft\'s technological defences, the possibility of incorporating a warning system which inhibits the use of the climb mode in autopilot upon the activation of the de-icing system, should be evaluated. In order to increase the level of operational safety, it is recommended that the company\'s Safety Management System (SMS) programme includes severe icing as a specific danger, so that the defences (technological defences, standards, procedures and training) can mitigate the risks. Using the aircraft\'s original flight manual is also recommended, so as to avoid the use of adapted versions that do not contain all of the required information. In addition, you are reminded to comply with the regulations established in the RAAC 121.133 a) with regard to updating the Operator Operation Manuals (OOM). Another way of improving security can be to establish means, resources and procedures which intend to emphasize the theoretical and practical instruction/training of upset and stall recovery. As such, new training practices are created, that involve the flight crew effectively identifying the signs and the aerodynamic phenomena that occur during the flight, prior to stalling (aeroelastic trepidation, among others), in accordance with the manufacturer\'s instructions. To consider the possibility of integrating modification No. 2650, "Ice Speed System", in all of the Saab 340 aircraft, as it is a tool that increases safety by alerting the crew of abnormal speed conditions during flights in icing areas. Consider adapting the course curricula of the theoretical and practical training, so that they include all of the manufacturer\'s manoeuvres in accordance with the "NEW CONCEPT", as well as including the piloting techniques adapted to each particular aircraft. Modify, improve and adapt flight simulator software for each aircraft type so that flight simulation become more realistic, and so that specific requirements can be tested. Modify the training programmes (theoretic and practical) so that the initial, promotional, and recurrent courses are obliged to include the following manoeuvres: a) Recognising when a stall commences and preventing it from happening; b) Recognising and recovering from an artificial stall warning; c) Recognising and recovering from a total aerodynamic stall; d) Practising how to recover from typical abnormal flight attitudes; e) In all of the aforementioned situations, the behaviour of the aircraft\'s automatic flight control systems and motor should be demonstrated. f) All of the aforementioned situations should also include unusual emergency procedures for cases in which system failure occurs. g) The process of slowing down the aircraft to achieve the aforementioned situations must be carried out with a ratio of approximately 1 kts/sec in order to properly represent the conditions for certification and comply with the manufacturer\'s information (both regarding flight characteristics and performances). It is recommended that effective control be exercised over the updates in the Operator\'s Operations Manual (OOM), which all air operators are required to follow, in accordance with the RAAC 121.133. It is recommended that a system which tracks compliance with regulations is implemented, in accordance with the growth and development of the air operators and the service providers. In order that the operating personnel (pilots, dispatchers, etc.) are properly prepared for assessing and managing the risks inherent in flight, the following is recommended: to make it a requirement that theoretical courses which are taught at air operators\' training centres, with regard to specific subjects such as meteorology, have to be taught (or supervised) by professionals with experience in the field of expertise. to incorporate the requirements set forth in the preceding paragraph into the applicable RAAC regulations. Distance from Neuquén Airport, NE to Comodoro Rivadavia Airport, CB as the crow flies is 760 km (475 miles).